PHIL COLLINS no jacket required in concert 1985 L.
Phil Collins artwork for the labels of the 1989 E.P. "I Wish It Would Rain Down"
Size is 388mm X 260mm. Very beautiful concert t-shirt. Condition:Good overall/ Very good considering its age. Rare PHIL COLLINS Genuine Hand Signed Limited Edition Print Of The Hits Album Artwork. limited edition of just 350 This is one sheet and has been framed to emphasise phil’s signature. This item is a preowned book in excellent condition, which I have folded to depict Phil Collins' self-portrait doodle, together with his signature. This is a custom design of my own making. Each original album cover presentation is professionally made to a very high standard using quality materials. We only use original album sleeves - not prints or copies. Rest of the World - £29.99. made with love by. PHIL COLLINS. PROMO PRINT. Great Talking Point. ORIGINAL PHOTO. Great Condition. 10" x 8" UNSIGNED photograph. For orders of £50 and over, see prices below. International Signed For (Orders over £50) £11.00. International Signed For (Orders over £50) £13.00. LENGTH - 78 cm. CONDITION : USED. CARD # 79. ISSUED IN 1988. IN MINT CONDITION. Here we have a 2 Disc Warner Music Vision Region 2 DVD Presentation of Phil Collins Serious Hits Live. Starring : Phil Collins. The Casing, Colour Cover Sleeve and Discs are all in Very Good Condition. He was the principal songwriter, lead singer, and bassist for theNEW WAVE ROCK BAND THE POLICE from 1977 to 1983, before launching a solo career. He has included ROCK, JAZZ, REGGAE, NEW AGE, WORLD BEAT in his music. 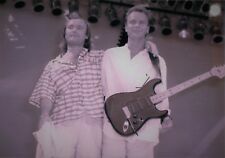 Original Press Promo Slide Negative - Phil Collins - 1980's - Good condition. Signed in bold clear gold pen by. Phil Collins on the album cover Sussudio 12" Extended Remix by John. Phil Collins Videos x2. Phil Collins 'Seriously live in Berlin' Phil Collins 'No jacket required EP' Condition is Very Good. Dispatched with Royal Mail 2nd Class. PHIL COLLINS. PROMO FLYER. This is rare UK A5 size PROMO flyer for the. DANCE INTO THE LIGHT UK TOUR. In Mint condition. Condition -Mint. A Rare & valuable collector`s item! Between 1983 and 1990, Collins scored three UK and seven US number-one singles in his solo career. Born and raised in West London, Collins played drums from the age of five and completed drama school training, which secured him various roles as a child actor. Phil Collins UNSIGNED photograph - M9596 - English singer and actor - NEW IMAGE! 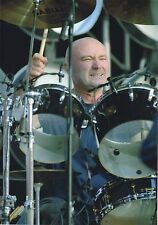 Original Press Photo - 10"x8" - Phil Collins - 1997 - Genesis - Good condition - Press details on reverse. Phil Collins UNSIGNED photograph - M9602 - English singer and actor - NEW IMAGE! Phil Collins UNSIGNED photograph - M9597 - English singer and actor - NEW IMAGE! PHIL COLLINS. 1 full-page ADVERT. carefully CUT OUT from 'Event' magazine -2017-. NOT the whole magazine. Phil Collins UNSIGNED photograph - M9599 - English singer and actor - NEW IMAGE! Phil Collins UNSIGNED photograph - M9604 - English singer and actor - NEW IMAGE! Phil Collins UNSIGNED photograph - M9594 - English singer and actor - NEW IMAGE! Phil Collins UNSIGNED photograph - M9598 - English singer and actor - NEW IMAGE! Phil Collins UNSIGNED photograph - M9603 - English singer and actor - NEW IMAGE! 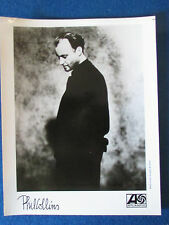 Phil Collins UNSIGNED photo - D2179 - English singer, songwriter & actor - SALE! WEA ‎– 2 51699-2. Phil Collins - No Jacket Required. Rare French Import. Virgin ‎– V2185. Phil Collins - Face Value. Gatefold Sleeve. Original Press Promo Photo - 10"x8" - Phil Collins - Genesis - 1990's - Good condition. Signed at the BBC Studios in Salford, Manchester in late January 2016. CERTIFICATE OF AUTHENTICITY (COA). Certificate Of Authenticity (COA). As is the nature of the Industry, autographs and signatures can vary ever so slightly - we may have more then one of a particular item, if so the item you will receive will be exactly as pictured, but the autograph maybe placed slightly differently.